When on the road to recovery it’s often important to find a place of relaxation and calm in which you can heal. 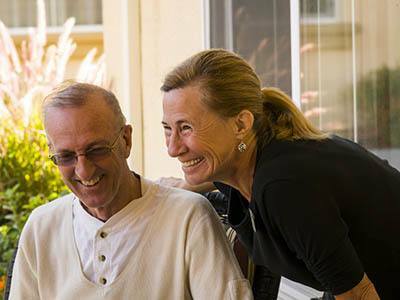 At North Ridge Alzheimer's Special Care Center we offer our guests the best rehabilitation services Albuquerque has to offer, but even more than that, we provide a peaceful and serene environment in which to recover. Our outdoor porticos and patios make wonderful places to sip coffee, relax and watch birds feed from our feeders. Or perhaps live music and poetry are more to your liking? Warm yourself up by fire in our main living room and enjoy the sounds of classical music filling the room on one of our many entertainment nights with live musicians. While our grounds are beautifully landscaped and our rooms are spacious, we also offer a highly-trained, on-site nursing staff and therapists at the top of their field. Occupational, physical and speech therapists and services are available to our respite guests in order to get seniors back on their feet and headed home, rested and ready to resume their life. We also know that caring for a loved one with memory loss or assisted living needs can be emotionally draining on family members and other caretakers. Let North Ridge Alzheimer's Special Care Center be your partner in care when in need of respite services for your loved one. Private and semi-private room options are available to our respite guests, as well as access to all of the amenities our community members enjoy. Call or visit North Ridge Alzheimer's Special Care Center today!